We've been promised smart automated homes for decades, but at long last it seems that they're finally on the horizon thanks to Apple and Google. The former's HomeKit was announced at last month's WWDC, and Google has just released its own API (Application Programming Interface) for its Nest devices. Of the two, Google's offering is currently the most interesting. An API for a thermostat hardly sets the pulse racing, but the Nest is no ordinary thermostat: it knows when you're home and when you're out, and that opens up some interesting possibilities. It isn't the only Nest product, either: there's the smart smoke alarm, and now that Google's acquired security camera firm Dropcam, Nest cameras can't be far off. 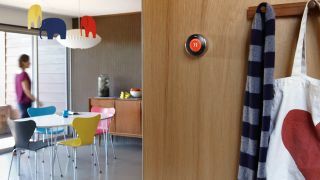 What does the Nest API mean for your home? When you read the list of Nest API partners, it's clear that Google plans to work with companies of all kinds, not just home automation firms. The list includes Mercedes-Benz and Jawbone, Logitech and Whirlpool, smart light bulb firm LIFX and garage door firm Chamberlain. If you're wondering what on earth those firms would do with a thermostat, let Google shed some light. According to Google, the Mercedes car could tell Nest when you're due to arrive home, ensuring your house is warm when you get there without wasting energy by starting too early. The Jawbone could spot when you're waking up and get the heating or cooling system working. The Whirlpool washing machine could know that you're out and switch to a refresh cycle so your clothes don't crease. The Logitech remote could set the temperature as well as your consumer electronics. And your smart light bulbs could make it look like you're home when you're out or hook into the smoke detector and flash red to alert someone who's hearing-impaired of a hazard. The API also works with IFTTT, the service that enables you to create instructions for other gadgets. Scripts could text you if the smoke alarm detects danger, or turn on a WeMo switch when you're nearly home, or turn off your Philips Hue bulbs when you leave the room. Google Now support, due this autumn, adds voice control and add Google Now's knowledge of your movements to the mix, and we can't imagine Android Wear integration is too far off. Bear in mind we're only talking about two Nest devices here, a thermostat and a smoke detector. Factor in cameras that can stream live video to mobile devices, or other devices such as movement sensors, and things get even more interesting. Is the Nest API Android-only? No. Most of Nest's users are running iOS, and Google will support that platform - and maybe integrate it with Apple's HomeKit in the future, although there are no public plans for that. The API is cloud based and designed for iOS, Android and web deployment. What access do developers actually get? Nest developers will be able to access home and away states to see if you're in or out, although they won't be able to access the motion sensors that Nest devices use to set those states. They'll also be able to access CO and smoke alerts and peak energy usage events. Connected devices will also be able to access the ETA (Estimated Time of Arrival) feature that Nest-compatible Mercedes cars can use, notifying them of your imminent arrival. Some of Nest's sensors aren't in the API yet, and there's no roadmap to indicate whether they'll be added later. For example, the Nest thermostat can monitor humidity levels and ambient light levels, but the API doesn't currently provide access to that data. As yet it's unclear what access, if any, developers will get to Dropcam devices such as cameras and motion detectors. Are there any privacy issues? Will I have a house full of ads? Nest says no. Speaking to Forbes, Nest's Matt Rogers is adamant that the Nest data won't be used for ill. "We don't want anyone to make the rob-my-house app." Will Nest vet the applications? Yes. While any company is welcome to write Nest-connected apps, they have to follow the developer guidelines and deliver what Nest calls "a really good customer experience". You can't join the Nest Developer Program without agreeing to play by Nest's rules. Won't a Nest smart home cost a fortune? Initially, yes: like any brand new technology, early adopters can expect to pay top whack for things that should plummet in price fairly quickly. The trade-off, though, is that Nest can potentially save you a great deal of money. Imagine Nest-connected blinds that automatically lower when it's sunny to save you from running air conditioning, or garage doors that turn off the heating when you leave for work in the morning, or appliances that know the cheapest times to use energy. In the long term, the key to widespread Nest use may be subsidy. Nest's devices aren't cheap, but in the US some utility firms are subsidising the price because it helps them manage demand peaks and reduce customers' energy usage. Speaking to Ars Technica, Matt Rogers said: "our goal is to make them free. Our products should be free. If you save people energy and save lives, those are good things that everyone should have." Nest isn't the only project Google is working on. as you can see from our highlights of Google IO.